because we want to highlight the importance of effective communication in exercising and protecting our human rights as reflected in the UN’s Universal Declaration of Human Rights across vast spheres of human endeavors and spanning all continents. Without being able to understand and/or express ourselves in our primary preferred language, we will simply not be able to explain or defend ourselves fully, especially when facing a difficult situation that threatens those very rights to dignity, freedom, justice, access, health and peace. This is where we as language professionals come in. As professionals we ensure that individuals who do not speak the dominant language are able to understand and be understood, and access these services, so that effective communication takes place and their basic human rights are protected. Terminologists trained in these specialized areas work to harmonize terminology within and among different languages so that due diligence can take place and consumer / patient safety can be ensured. 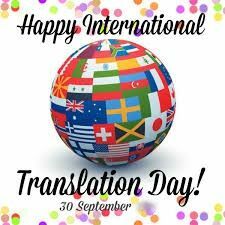 The same applies when terminologists compile glossaries or translators and interpreters intercept and decode written and oral foreign-language messages pertinent to intelligence gathering. Other areas where language services are essential include governmental services, social services, and the rapidly growing field of community translation where there is a myriad of documents that lawful citizens need to understand in order to be guaranteed their rights and have their security protected. The inability to obtain these essential language services in peace time and in conflicts has resulted in many horrifying documented cases of injustice, incarceration and irreversible negative health outcomes, with many more remained documented. We all need to work together to raise awareness and ensure that language services are available at all the interfaces between the public and service-providers. Please join us in educating the public about language rights on International Translation Day, 30 September 2014.